I won't tell you just what the age is but there is a five and a zero in it. He's not 5 so keep guessing! Kevin and I last night went out for dinner. Partly courtesy of my Godmother Kathie and her husband Larry, we went to use the gift card at Grand Lux Cafe in Sawgrass Mills. We could have went to any of three in nearby areas, this one was my idea as I wanted to get to see the mall. I haven't been there in over a year, and it was going to be a night out. We got to the mall around 5:30 and immediately went to try to find the place. Murphy's law being what it is, we drove 3/4 of the way around the mall before we went and started cruising the parking lot. You see the lot was slammed with cars. Kevin's normal comment is particularly appropriate "You know... we ARE in a recession you see!". Ok, yes, but sometimes you just have GOT to get out and see other people. Sawgrass being a destination mall in a resort city in high season is just going to be busy. Cruising the lot for about another 15 minutes, we finally found parking "way off over there" near "Needless Markup". Or basically as I usually call it "Coventry" ... or East Naples. We got in, immediately got a table and were seated. The portions were large for anyone else, although my Asian Chicken Salad was what I am used to having when I make my patented dinner salad in a mixing bowl which is around 2 quarts of "stuff". Roughly. Kevin got an excellent Black Angus Burger with fries, and I have to say his portions were generous as we were warned, but more "reasonable". We're both big guys with high metabolisms so we thought it was fine. A smaller person might want to consider forgoing dessert. 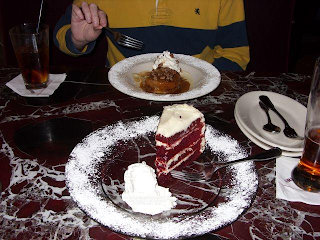 I didn't sample Kevin's because I was working on that massive slab of Red Velvet Cake. The cake was simply excellent. I thoroughly enjoyed it. It was however, huge. What I should have done was to have around 1/2 of the cake, then ask to take away the rest for today. As a result it became a challenge for me to finish it. I recommend the cake, as I did to the neighboring table, although I suggested that they split it between husband, wife and pre-teen daughter! But finish it I did and that became the entertainment of the evening. Both Kevin and I walking around feeling bloated with meals of size that we normally don't eat more than once a quarter. While we are both big men, we are both reasonably fit. The mall presented an opportunity to walk some of our meal off, and it was needed. On the other hand, the crowded parking lot meant a crowded mall. It looked like the days before christmas in there as the place was crammed with people. Oh well, it was literally for us, a once in a year opportunity. All in all it was a fun night, we did things we normally did and I got to spend time with Kevin in the mall.